Jessie Shimmer's roguish lover, Cooper, has been teaching her ubiquemancy, the art of finding the magic in everyday things. But things go terribly wrong when the couple try to call a rainstorm in downtown Columbus. A hellish portal opens, and Cooper is ripped from the world. Worse yet, a vicious demon invades the city. Jessie barely manages to slay it, but she's gravely wounded and the capital's center is destroyed. As if losing an eye and a hand isn't bad enough, the city's ruling mage, Benedict Jordan, brands her an outlaw. With only her ferret familiar to help her, Jessie must find the dimension Cooper's trapped in and bring him back alive before sinister machinations make both of them vanish for good. 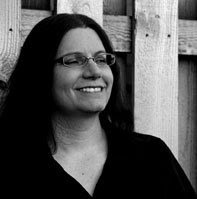 Lucy A. Snyder is the author of Sparks and Shadows, Installing Linux on a Dead Badger, and the upcoming Del Rey novel Spellbent. Her writing has appeared in Strange Horizons, Farthing, Masques V, Doctor Who Short Trips: Destination Prague, Chiaroscuro, GUD, and Lady Churchill's Rosebud Wristlet. Lucy was born in South Carolina but grew up in the cowboys-and-cactus part of Texas. She currently lives in Worthington, Ohio with her husband and occasional co-author Gary A. Braunbeck.If genres were wall-building nations, Lucy's stories would be forging passports, jumping fences, swimming rivers and dodging bullets. You can learn more about her at http://www.lucysnyder.com/. I just saw this cover over on Dan dos Santos website and I was wondering what book/author it was for. Now I know. Thanks! Great find!! I added this to my list recently. I just love that ferret.